Gardening in a cloud of butterflies, I am reminded of all those who gardened before me. My garden wouldn't be the same without them. Just as much as I love my garden, I get as much joy watching the butterflies enjoy my garden too. I now find myself sub-consciously trying to plant more nectar plants for these flying mood-uplifters. Aren't they lovely, so welcome, yet so threatened now. We must keep planting for them. 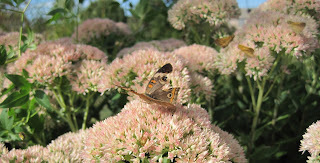 Instead of the butterflies, I looked at the Autumn Joy Sedum. That plant has been gorgeous this fall in Idaho and maybe elsewhere in the west. We have had a slightly cooler summer and autumn Joy has bloomed later, had fuller blossoms, seems to be lasting longer. I love the butterflies they are so graceful. What a great shot and title for the post. As different flowers come into bloom the butterflies and bees take their tour of my garden. Now as with yours, they have moved to the sedum. They have had enough of the Joe Pye weed, though occasionally still linger on the butterfly bushes. Hi Carol, what a lovely thought, both about the butterflies and those who went before us. We are all formed by our ancestors, gardeners or not. To Pam English garden, I believe that is a Buckeye. Visited Olbrich Botanical Gardens on Saturday and could not believe the clouds of monarch butterflies flitting everywhere! My garden has a few but not enough to consider a cloud, alas. We have always tried to plant to attract butterflies in our side yard. We have passion vines running rampant that provide food for the caterpillers and nectar for the adult Gulf Fritillary butterflies. There will often be 10-20 butterflies in the morning when I go out to work in the garden, paint some flowers or take my dogs out, it is wonderful to watch them flying about. Looks like you might be in Dallas, I live in North Richland Hills.